At CNCC students take advantage of a full array of resources designed to help them succeed in college. From Academic Advising, to Tutoring and Learning Centers, and an early alert system, CNCC has the faculty and learning professionals in place to maximize student success. 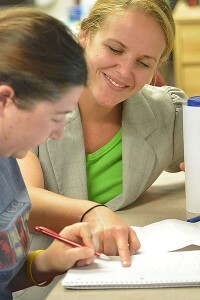 Academic Advising at CNCC is an intentional, educational partnership between a student and their adviser that has one, bottom-line goal: helping students succeed. Advisers generally meet with students at least once a semester, helping them learn how to make decisions about their college experience, as well as provide academic assistance. Academic Advisers are well-versed in the programs of CNCC and how they can integrate into life after CNCC.